Prunus cerasus var. avium L., Sp. Pl. 1: 474. 1753. Cerasus avium (L.) Moench, Methodus 672. 1794. Druparia avium (L.) Clairv., Herb. 159. 1811. Linnaeus, C. 1755. Fl. Suec., ed. 2, 165. USDA, ARS, Germplasm Resources Information Network. Prunus avium in the Germplasm Resources Information Network (GRIN), U.S. Department of Agriculture Agricultural Research Service. 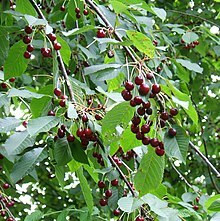 For more multimedia, look at Prunus avium on Wikimedia Commons.